Today new life breathed into one of my favorite structures in Downtown Tulsa. A new eatery opened in the space originally known as the First National Autobank. Built in 1959 the complex was a model for suburban banking- back when "suburban banking" meant four blocks from the main bank. When the bank opened it was an instant landmark. 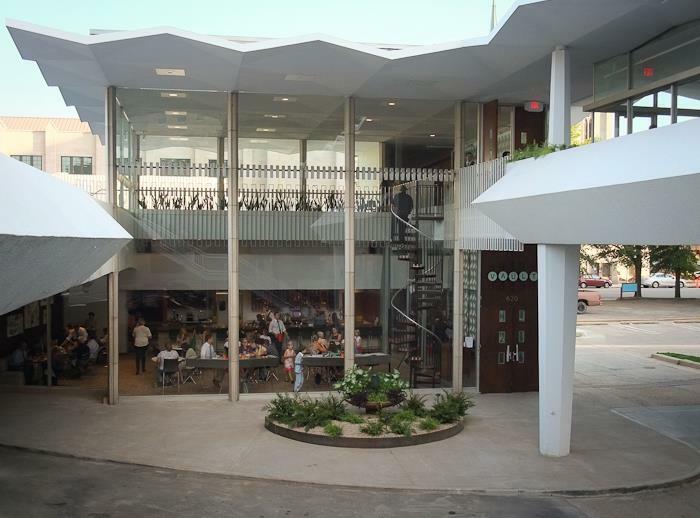 It was designed by local firm of Mc Kune, Mc Kune & Associates who gave Tulsa many modern additions to its skyline (Petroleum Club Building, McClure Hall, Holiday Inn). Located across the street from Central High School there was no need to point out the contrast of styles. A folded-plate roofline with ziggy-zaggy blocks played up the hugely popular space-age theme. The drive-thru lanes were the first in Tulsa and a Bertoia fountain out front greeted walk-in customers (and gave them a gentle dousing, so the story goes). An upstairs parking terrace added to the Tomorrowland vibe. Senior class photos were snapped on the steps. There was even a popular picture postcard that featured the entryway (and that pesky fountain). The Autobank was indeed a hit. But the years- and ensuing bank mergers- had not been kind to the futuristic complex. Rumors of demolition had circulated for years. Neglect was taking a toll. The Vault as it appears today. I'm relieved to see this building still standing- let alone returned to its former glory. Restoring the bank's Mid-Century Modern look and feel must have been a priority- because much of the damage done in recent years has been rectified. The new restaurant is appropriately named The Vault and a product of Elote founder, Libby Auld. The interior is tastefully adorned with Eames shell chairs and period artwork. The menu is a throwback collection of Sixties fare and retro cocktails to match the Sixties ambiance. But I am relieved that some of the practices of that era were left in the past. For instance, there is no smoking section.